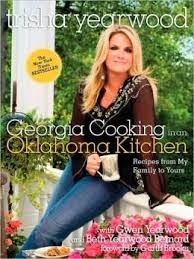 With full-color photographs taken in and around Trisha’s homes and a foreword by Garth Brooks, this soul-warming slice of Southern life will delight country music fans and home cooks alike. Best of all, this is un-pretentious food that is easy to put together, satisfies even big country appetites, and tastes like home. Trisha’ s warm evocations of pre-paring food for loved ones will transport you back to your own childhood. These are recipes you’ll enjoy with your family for years to come. Buy the cookbook HERE.